Today’s hike was a solo* mission today which was okay with me. There are few things more cathartic than sitting on open ledges enjoying amazing views, fresh air and beautiful weather while being alone with your thoughts looking out into the world. And I could not think of a better place to go than my favorite spot in Maine – the Evans Notch area. I love this area because it is far less popular than other hiking destinations. This was clear today with no one else being on the trail at all. Being mindful of my training needs I wanted to try to get the 7.4 up and back along the back side of the Baldface Circle done in about 4 hours. I made decent time getting up to the shelter (2.5 miles 1600′ gain) completed in an 1 hour 40 minutes. I felt like I could have done even better, but the snow was really hard to travel on because it was not deep enough for snowshoes and it was too deep to bare-boot it. On top of that the snow was really loose, wet and soft so regardless if I had my snowshoes on or just my micro-spikes, I was sliding around everywhere. I used my micro-spikes for the first 1.5 mi and then I was high enough where the snow was somewhat deep enough where I could move a little better on snowshoes. The most nerve-wracking part of that is that you never know where your knees or ankles will go so it is hard to keep up a good head of steam for fear of rolling over an ankle or popping out your knee. As it was, by the time I got back to the car my knee was absolutely killing me. After the shelter the real challenge began. In the approach up to the ridge through the Alpine Zone (about .7 miles and 900’ of vertical) there was no sign of a trail. Foot prints were obliterated and cairns and blazes were nowhere to be seen. The snow was deep –about 6-8 feet is my estimation – but it was too steep and loose on the top for snowshoes, so I ended up switching back to my micro-spikes. This allowed me to have a better feel for my foot placement and more control. I ended up wasting a bunch of time picking a way up without being really sure I was anywhere near the trail. Finally, the route that I was on got too steep for my comfort level and after a brief, unexpected slide of about 6-8 feet (which definitely made my heart rate up) I opted to call it a day and sat down for some lunch. It was pretty frustrating because I would estimate that I was about 300’ and .25 miles from the ridge line which only put me .75 miles from the summit, but since I was solo and there were zero signs of any other hikers anywhere on the trail, I felt it was the right decision, after all the mountain is not going anywhere. After lunch I turned back and raced down as fast I could, slippin’ and slidin’ the whole way down. But all is well that ends well. My estimate is that I did about 6 miles up and back with about a 2100’ gain in 3 hours 57 minutes. All in all I am on track and most importantly, I made it back down. So, that will be good for a win in my book, any day. *A quick note on hiking solo: One of my Old Man’s favorite pieces of universal advice is “Don’t be stupid.” Hiking solo can be dangerous and even on routine hikes, accidents can happen. If you plan to hike solo be safe, be smart and make sure that you have a plan including cut off times for turning back and so forth. And always, be it hiking solo or not, let multiple people know where you are going and what your anticipated timeline is. Hike Safe. 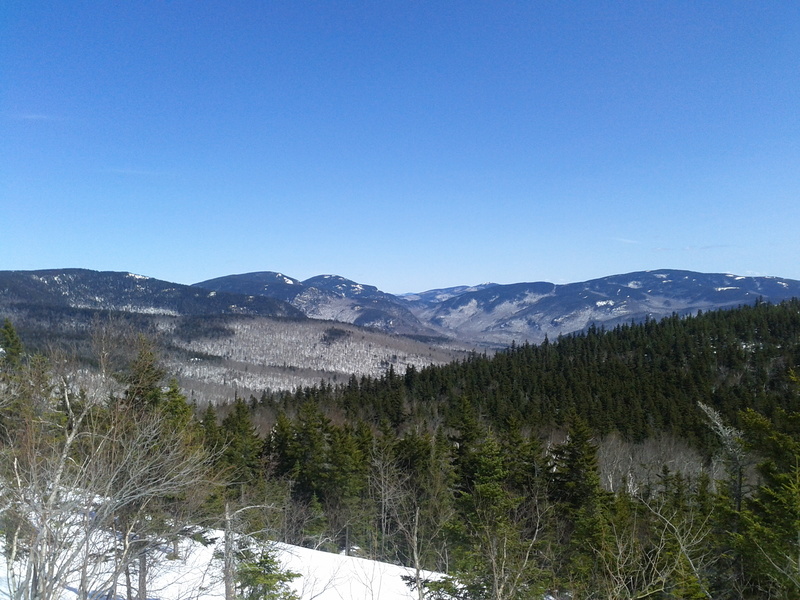 This entry was posted in Hikes, Training and tagged Baldface Mountain, Evans Notch, Hiking, Snowshoeing, White Mountains. Bookmark the permalink.